Embrague(maza-disco) MINI MINI Cooper S, Año: 2004 Código interno: 150812. Atención personalizada 24H. Español, galego, english, french, italian, german, portuguese. Nós podemos verificar isso. Wir können es überprüfen. Embrague(maza-disco) MINI MINI Cooper, Año: 2002 Código interno: 149078. Atención personalizada 24H. Español, galego, english, french, italian, german, portuguese. Nós podemos verificar isso. Wir können es überprüfen. Manufacturer Part Number 22A2204. Mini clásico brazo de palanca de embrague VERTO PRE. El kit incluye: 1x manguera de goma de embrague, tornillo hueco embrague 1x, 2x arandelas de cobre, 1x embrague tuerca de la manguera, 1x embrague manguera de arandela elástica. La pieza 21526774078 fue encontrada en los siguientes vehículos MINI R50 R52 R53 R55 R56 también R57 LCI R58 R59 R60 R61. MINI R53 (09/2000 – 11/2006). MINI Cabrio R52 (11/2002 – 07/2008). MINI R57 convertible (10/2007-07/2010). Part number for reference : DAM5355. 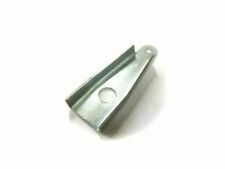 Classic mini VERTO clutch lever arm, this is the short clutch lever arm which is used on mini models made from 1982-2000. Part Number - NT610041. This sale is for ONE nut. 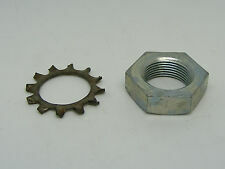 The locking nut for both pre verto and verto clutch plungers. 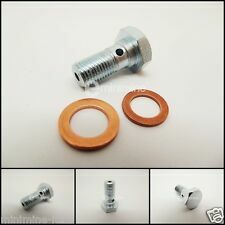 Classic Mini Clutch Plunger Throw Out Locking Nut. Manufacturer Part Number 22A180. Mini clásico pistón de embrague VERTO PRE. Esta es la compañía que lleva a cabo que el lanzamiento del embrague cojinete y en el otro extremo tiene un agujero para el brazo de palanca de embrague. Cilindro maestro de embrague cilindro maestro de embrague 6774078 MINI MINI Cabrio (R57). MINI MINI Descapotable (R57) Cooper. Cilindro maestro del embrague. - Modell/Typ MINI CABRIOLET (R57) COOPER. ¡Es una ayuda pero no es 100% garantía! Part number for reference: 22A2204. Classic mini PRE VERTO clutch lever arm. Long clutch lever arm for all PRE VERTO models. Ensure you adjust the clutch properly otherwise the hydraulics are powerful enough to bend the ball on the end of the clutch arm. Part Number - C5192A. Classic Mini VERTO Clutch Hose. Classic Mini VERTO Clutch Hose Kit. Classic Mini Clutch & Brake Banjo Bolt Kit. This sale is for ONE banjo bolt & TWO copper washers. This specially designed bolt goes through the large hole in the end of certain clutch and brake pipes/hoses. Manufacturer Part Number GRB238. Mini clásico embrague verto cojinete de empuje pre. Este es un cojinete de calidad hecha a las especificaciones OE. A continuación puede encontrar una traducción automática al español. THIS CLUTCH KIT IS ONLY A SAMPLE OF WHAT WE HAVE WE DO KITS. If you are wanting more than one item. Manufacturer Part Number C5192A. 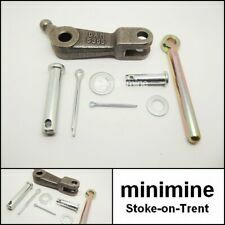 Classic mini embrague y freno banjo bolt kit. Este kit contiene un perno banjo, dos arandelas de cobre. Part number for reference - CLZ512. 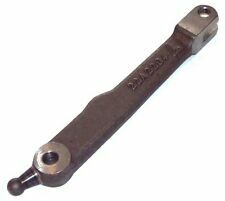 Classic mini clutch master clevis pin. This attaches the clutch master to the pedal. Part Number - DAM5355, 13H396, CLZ518, CLZ628. This sale is for ONE kit. The short verto clutch arm standard on all verto clutches, complete with the correct size clevis pins, split pins, washers and slave cylinder pushrod. Categoria prodotto: Organi motore/Pompa frizione. Essendo il ricambio usato potrebbe presentare leggeri segni di usura. Anno: 2006. - COD contrassegno (Solo in italia - Selezionabile solo da PC). These will fit all Gen 1 BMW MINI Cooper S models including JCW and JCW GP! Part number for reference: 22A180. Classic mini PRE VERTO clutch plunger. This is the carrier that holds the clutch release bearing and on the other end has a hole for the clutch lever arm. Suitable for all mini models made from 1959-1982. Manufacturer Part Number 1G5999. Mini muelle de retorno de embrague clásico por cilindro receptor no verto, que ayuda al retorno de la varilla de empuje. A continuación puede encontrar una traducción automática al español. Placa de anclaje clásico Mini embrague resorte de retorno. Esta placa está en el extremo del brazo de embrague largo A-plus pre para sostener el resorte de retorno. Classic Mini or Metro Clutch cover or Wok which has been lightened. - Holes drilled into the top half of cover. - Starter nose removed. - Lower volt holes slotted to allow easier removal on the car. MPN KN23032.4.1. KN < abarcan clase = notranslate ' > 23032.4. 1 embrague bomba MINI COOPER S R53 < abarcan clase = notranslate ' > 1.6 125KW 3 p B m 6 piezas (2006) utilizan. Gama de productos: Motor/bomba embrague de órganos. Desplazamiento en cc 1598. Combustible Gasolina. Fabricante MINI. Serie Mini ONE. KFZ-Hubraum 1598 ccm. KFZ-Typ Mini ONE. KFZ-Modell Mini. Descripción del producto. 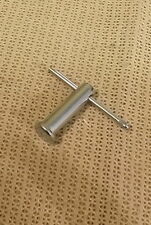 Classic mini clutch or brake banjo bolt, fit's 1959 -2000 - New. Mini Centre Berkshire. Oxfordshire RG9 4QG. Part Number - C5192A. Classic Mini VERTO Clutch Hose. Classic Mini VERTO Clutch Hose Kit. Classic Mini Clutch & Brake Banjo Bolt. This sale is for ONE banjo bolt. This specially designed bolt goes through the large hole in the end of certain clutch and brake pipes/hoses. Classic mini braided VERTO clutch hose, will fit all mini models made from (1982-2000). High quality uprated hose made by Goodridge, supplied with fittings inc. clutch hose nut and copper washers. Part Number - GRB238. Classic Mini Clutch Release Thrust Bearing PRE VERTO. This sale is for ONE bearing only. This bearing will fit only pre verto (long clutch arm) Mini models from approx 1959-1984. Part Number - 22A2204, 13H396, CLZ518, CLZ628, 2A3601, 2A3600, 1G5999. This sale is for ONE kit. Classic Mini Clutch Lever Arm PRE VERTO Kit. 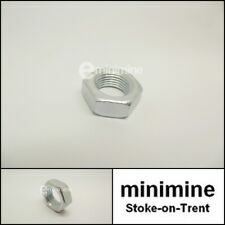 We are Minimine Ltd, from Stoke-on-Trent, we have been trading in Mini parts and accessories since the early 1990's. 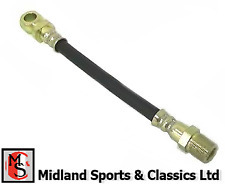 Classic mini Goodridge long braided clutch hose, this hose runs from the clutch master cylinder to the slave cylinder and will fit verto and pre verto models. Mini Cooper 997, 998, 1071 S New-NOS 22A539 Pressure Plate for Coil Spring Clutch fitted 1961-64. Very likely manufactured in the 1970's. The BL Distributor label on original box in the picture confirms part number 22A539. If you are wanting more than one item. Part Number - 1G5999. 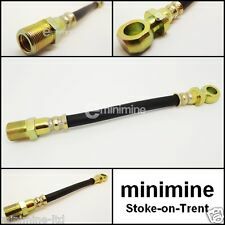 We are Minimine Ltd, from Stoke-on-Trent, we have been trading in Mini parts and accessories since the early 1990's. 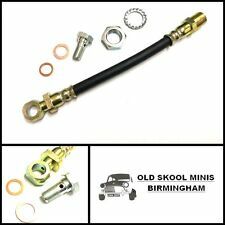 Classic mini braided PRE VERTO clutch hose, this will fit all minis made from (1959-82). High quality uprated hose, made in the UK by Goodridge. Part Number - GVP1009 & C5192A. This sale is for ONE hose, ONE banjo bolt, TWO copper washers, ONE nut & ONE correct star washer. The verto clutch hose and fittings for Mini models from approx 1982 onwards, when the clutch changed from pre/non verto to a verto type. Kit de herramienta de alineación de clásicos Mini 1000 Clubmann Cooper 17 pieza embrague Universal. 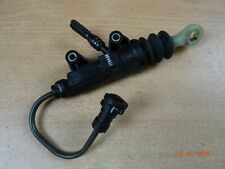 Part Manufacturer Number VW65EE01439. Other Part Number EE01439. Audi, Citroen, Fiat, Ford, Honda, Mazda, Mitsubishi, Nissan, Opel, Peugeot, Renault, Rover, Saab, Toyota, Vauxhall, VW, Volvo. Part number for reference: DAM5353. Classic mini VERTO clutch plunger (release bearing carrier). Suitable for all mini models made from 1982-2000. PART NUMBER: 13H396. 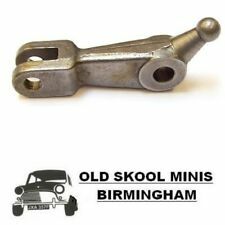 Classic Mini Clutch Push Rod � Verto pre-Verto cars - all cars up to 1982 Classic Mini clutch push rod Clutch push rod that goes into the slave cylinder. 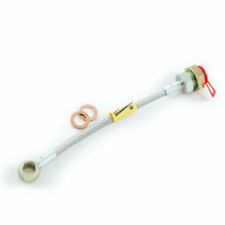 This clutch push rod is for both the Verto and pre-Verto (diaphragm) clutch systems. Part number for reference- 2k8686. Fits both verto and non-verto models. De 24428631561 fueron encontrados en los coches siguientes Mini - Cooper - uno F54-F55 F56 F57 F60. MINI Clubman F54 (02/2015 — 02/2018). F57 Cabrio MINI (12/2014 — 10/2017). MINI F56 (04/2013-07/2018). Model: R50 upto 04/2007. It is your responsibility to make sure when ordering this part is correct for your car and we are will to assist you with this. We will gladly assist you with this confirmation. Classic mini VERTO clutch hose kit, this is suitable for all mini models made from 1982-2000. Kit includes : 1x Rubber clutch hose, 1x Clutch banjo bolt, 2x Copper washers, 1x Clutch hose nut, 1x Clutch hose spring washer. Mini R55 / R56 / R57 / R58 / R59 / R60 / R61 Petrol Engines 2005 -. MLR BMW MINI CLEAR PVC COVERED FULLY STAINLESS STEEL BRAIDED CLUTCH HOSE. T he pipes have a transparent / clear PVC covering over the Stainless Steel braid for added protection and easy wipe cleaning. PART NUMBER: LUF10005. Clutch oil seal. Part Number - AHU1564. This sale is for ONE sleeve. 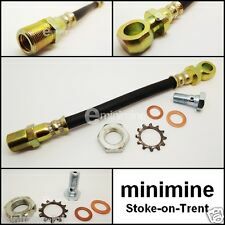 We are Minimine Ltd, from Stoke-on-Trent, we have been trading in Mini parts and accessories since the early 1990's. Part number for reference : GRB238 (GRB201). Classic Mini Competition PRE VERTO Clutch Release Thrust Bearing. This will only fit PRE VERTO (long clutch arm) models made from approx 1959-84. Classic mini VERTO clutch hose kit, this is suitable for all mini models made from 1982-2000. 1x Clutch banjo bolt. 1x Clutch hose shake proof washer. 1x Clutch pipe from master cylinder to flexi hose. Part number for reference: 22A1761. Classic mini flywheel housing/clutch casing locktab (3-holes).